WELCOME TO FIRST LEGO LEAGUE! 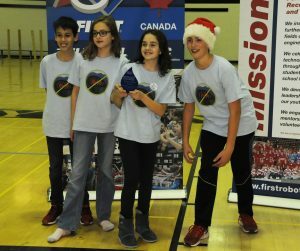 Each year, FIRST LEGO League introduces a scientific and real-world challenge for teams to focus and research on. While the team is involved in designing and programming LEGO Mindstorm robots, they are also busy finding solutions to the various problems they are given. They meet for regional tournaments to share their knowledge, compare ideas, and display their robots. We had a great time helping our FLL teams at yesterday’s tournament! Big shout-out to all our Youth Mentors for their help. Our 3 FLL teams received 5 call-backs (meaning that they impressed the Judges in the first round of presentations, so they were invited back to re-present to different judges). 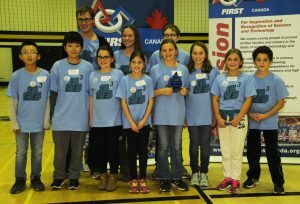 Our Mussel Tussle team (coached Mr. Misha Palityka) won the Design Award and the Ice Cubed team won the Judge’s Award. Congratulations to Brian, Emma, Ethan, Ivan, Joshua, Michael, and Ramish. Thanks also to Martin for videos and photos (more to come soon), to Connor for volunteering as a Game Announcer, and to Mr. Peter Lowes for all of his hard work!